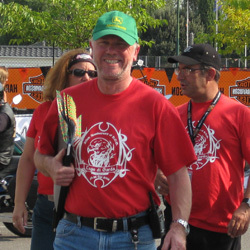 The 2008 European H.O.G. Rally this year was held in the delightful lakes region of Northern Italy. Italy is a favourite destination for Chelsea & Fulham H.O.G. 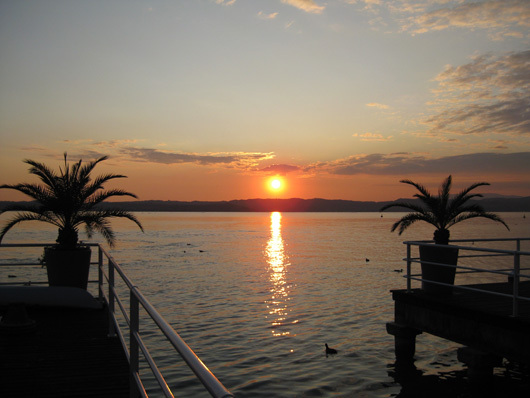 Chapter and the lakes district is one of the prettiest in Italy. Who needs more of an excuse? 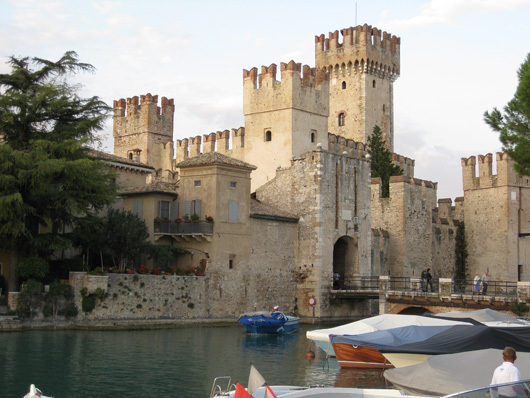 This year’s Rally was to be at the southern tip of Lake Garda near historic Sirmione. The site was enormous and at the base of a dramatic peninsula with the old walled town and castle at its very end. As always the Italians were fantastic hosts. In September the weather was a concern for some of us and as a friend from London pointed out “there aren’t lakes there for nothing you know!” I arrived on Sunday with a party of friends from America. I had met Jack and Bonnie Domingo from Chicago on a guided tour to the European Rally in Killarney in 2006 and we became great friends. Jack and Bonnie brought with them two dear friends and H.O.G. 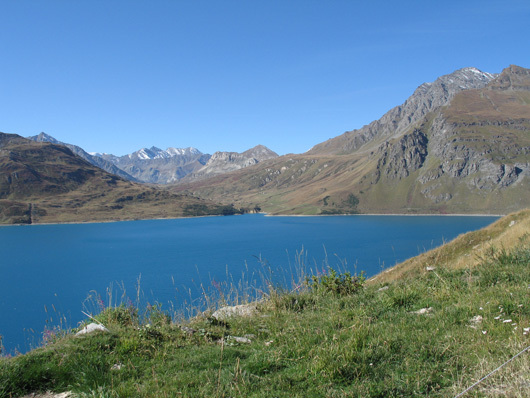 members Bill and Linda Hlavacek and on Tuesday 16th September we set out from Windsor to ride through France, Belgium, Luxembourg, Germany and the Austrian Alps over six days. Along the way we experienced some truly spectacular cuisine and stayed in some exceptional hotels, including a gem in the brewing town of Poperinge, Belgium. A highlight was the Recour Hotel, where chef and owner Bert Recour not only helped us park the bikes but also laid on the most spectacular meal, including some of the most perfectly matched fine wines. Although I had pre-booked this one I had no idea the owner was amongst the best chefs in Europe, a fact also unbeknown to a couple who owned a hotel in Amsterdam and, like us, simply picked the hotel from a list on the internet for a quite weekend away. The joy and danger of not pre-booking hotels along the way is the huge variation of quality you experience, but it adds to the adventure. On the trip down we had roughed it at the side of the road, eating quite disgusting deep fried burgers and stayed in some VERY ordinary hotels. On the other side of the coin we had sampled the delights of a five star spa hotel with SERIOUSLY between season prices, try under one hundred Euro’s for room, four course dinner, breakfast and full use of massive spa and pool areas. One hotel I would not have picked from the comfort of an English armchair. Our route too, although carefully planned, was not recced beforehand and had its highs and the odd low. Actually, on the riding front there were very few lows. We had ridden alongside the Rivers Mosel and Rheine and passed through the Black Forest which was a revelation to me. Not dark and wooded as I had expected but open, light, winding roads which climbed and plunged through some amazing countryside as spectacular as we’d been promised. We narrowly missed an umpa band in Vianden, Luxembourg when we hid in the next room while the obnoxious hotel owner butchered Elvis songs in a one man Karaoke. We dined with a German coach party and ate from a fixed menu in German which was way beyond any of our comprehension and rode the simply spectacular Timmeljochpass in the Tirolian Mountains of Austria. The ride down was an adventure from start to finish. For the most part the weather had been fantastic apart from some pretty severe early morning frost and fog crossing the pass that morning into Italy. As we neared Lake Garda the sun shone and we had all but forgotten the bitter cold of the morning. Before long we were all installed in our accommodation. I had found a villa, a renovated apartment situated amidst a vineyard, not far from the site for Jack, Bonnie, Linda and Bill. I was staying in the chalets at the nearby camp ground, fully booked by Harley-Davidson. The accommodation was bright, clean and tidy (if a little cramped!) after the luxuries of some of the hotels we had stayed in and I’m told the facilities were excellent. Mind you with everything to see and do at the rally I spent precious little time in my room. I was part of the tagging team and had plenty to do before the official start date of Thursday. I did manage to find some time to take the guys (and girls) out to find a cookery school they had booked for later in the week and we had a good look round the local area which offered plenty of riding opportunities. By Thursday we were ready to receive our guests at the Rally. As usual most of those that had pre-booked came from Northern Europe, especially the UK, while the Italians seemed to love to leave it all to the last minute. I suspect the Italians would turn up whatever the weather, (never folk to miss a good party!) but one can never be sure. There was certainly plenty of food and entertainment with several restaurants on site along with all the usual fast food stands and all at surprisingly reasonable prices. One restaurant in particular became a favourite and was luckily just 100 yds from the ticket and tagging area. 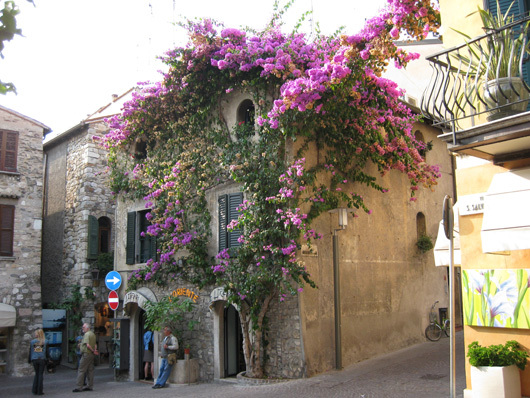 For safety reasons the Italian authorities had imposed a one way system. I could see the reason for it but it did give us a slight problem as the main parking area was before the designated tagging area. There was little we could do about that and it actually all ran very smoothly once we had managed to explain it in half a dozen different languages. Its funny isn’t it? No matter how many signs you put up folk always seem to love to ask and the Italians love the odd friendly argument as well. We were rushed off our feet on that first day but all went well and everyone was happy. The sense of fun was palpable and despite an occasional wait for tickets and tagging everyone was in excellent spirits, meeting friends new and old wherever they were. I even felt at times that the experience of a well managed queue which was new to many nations was part of the fun and definitely an enjoyable novelty for our Italian hosts. The day seemed to rush by before our team had a chance to stand down and hand over to the security guys for the evening. Now it was party time and boy, there were plenty of folk to party with! The main arena contained an enormous open stage with an audience capacity of thousands. The whole area was laid out as two circles, one bounded by Dealer showcases and the main Harley-Davidson exhibition area, the other by bars and food areas. This gave a great atmosphere both during the day and in the evening where your next beer was never too far away and the bands were ever present. There were plenty of areas away from the hub for those who simply wanted to meet with friends for a quiet drink and as the evening wore on these became increasingly popular, especially as the last band finished at around 1.00am. At the end of it no one seemed keen to burst forth and say stop so it all worked rather well. Friday was again a busy day at the tagging area as we struggled to try and guess how many folk would be arriving and on whose shift. Luckily it was generally quite steady with the busiest time just before lunch. NO self respecting Italian would dream of travelling or even arriving at lunch time I was told or Frenchman or Spaniard I suspect. I did get a chance to wander round the Dealer stands and the main display area and it was great to see all the 2009 bikes, many in non standard trim thanks to the Parts and Accessories catalogue (or should that be catalog?). Surprising how much you can improve an already great bike with just a few additions. The Beach bars on the Cross Bones for example and as for the all new styled V-Rod Muscle WHAT a difference! The Trader area was interesting too with a young lady selling VERY small bikini’s being a popular stop for a lot of guys. Actually she wasn’t that young and the fact that she was also modelling them may have had something to do with it! The H.O.G. hospitality area was also popular, hosted by the local Brecia and Verona Chapters, where you could book local guided tours. This was in addition to the self-guided rides and the organised Poker Run and Observation Run. There were a variety of bike related riding games and a Chapter Challenge Competition while there were some spectacular bikes entered in the Custom Bike Show. Later that day the Chelsea & Fulham Chapter arrived, great to see some familiar faces, but so little time to chat. Robin Lahiri and Buzz Lightyear (AKA Charlie Lewis) met U.K. and Ireland H.O.G. Manager Marjorie Rae for the first time, which I understand was hilarious, but I’m sure they’ll tell you all about it one TUP night. That evening we all met up to ride out to the Hotel Bellerive in Salo for John Warr’s now famous Chelsea & Fulham Party. Most of the Chapter were based in or around Salo so didn’t need to ride to the party but we were all out done by Robin who chose to arrive at the hotel’s lakeside dock with Buz, Rudi, Del Boy and his lovely wife-to-be Kirtsy in a timber Riva Motor launch, probably one of the most beautiful, classic boating designs of recent times. The next day I had managed to wangle time off to join the Chelsea & Fulham ride out. I miss timed my departure and got caught up in the line up for the Parade and almost didn’t make it to our RV! We all met up at John’s hotel and at 10.00 sharp 35 bikes rolled out in tight formation. John and Colin had picked a challenging route up the mountainside into the National Paro Dell’Adamello at an elevation of some 6000 feet. The ride was well organised as always and the scenery quite dramatic as we climbed and climbed. The many switchbacks made the last few miles quite slow but definitely worth it as the views became grander by the minute. Even the smelly diesel four-wheel drive we found ourselves stuck behind pulled over for us as we sailed on, ever upwards. The altitude caught a few of us out though as it was mighty cold for the last 15 minutes or so. Definitely not suited to the fingerless gloves! At the top John had pre-booked an authentic rustic inn and we were treated to a warming feast of homemade pasta and deserts. Actually thinking about it the beer was warm too but I hardly noticed! Wood burning pot belly stoves and extraordinary views made this one of our best rides of the year. We all said our goodbyes and I headed off back down the mountain. I was due back on site in less than an hour and set off first. Colin was close behind and a while later was fortunately able to help me right some poor fellow who clearly found himself two up on completely the wrong road. We could see him from a fair way above and he was clearly having trouble with the tight turns. I held back as he approached a particularly tight one in completely the wrong position. This time he didn’t get away with it ending shiny side down on his Screaming Eagle Ultra. Colin and I both lent a hand but I had to leave Colin to massage the chap’s tender ego before continuing on alone. The sun rose on Sunday morning and all too soon it was time to head for home. Our route home was to be via the Col d’Iseran, a favourite pass of mine for its quite spectacular scenery and snow covered peaks. 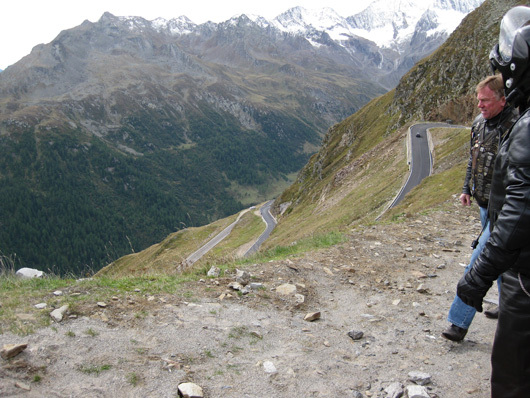 Just south by southeast of Mont Blanc it is the highest pass in Europe at nearly 10,000 feet. We took to the Alps on our second day and I must say the Col did not disappoint. It’s an extremely challenging ride up such a steep climb and the first time I have attempted it from the Italian side but all went well. My American friends excelled, especially given they were on large rentals fully loaded and two up. I’m glad to say although they seemed apprehensive they all agreed that it was well worth it when we reached the summit and not perhaps as daunting as I had painted it. The clear blue lakes on the climb, the amazing crisp air at the top and the unique views on the descent to Val d’Isere several thousand feet below made this one on the highlights of the trip. The rest of our ride home was again an exciting combination of hotels from the mundane to the spectacular with cuisine to match. The roads we picked as always offered the chance to test the handling of the bikes if we so chose or simply to cruise along taking in the traditional French countryside and stopping in out-of-the-way little village cafes at our leisure. European roads are so much less congested than those at home and motorcycles and bikers alike are so much better received, especially in France. The joy of a bike in France, indeed anywhere in the world is that you can visit places not accessible to the tourist horde. Places where coach tours are unheard of and the nearest airport car rental stand might as well be on the moon. 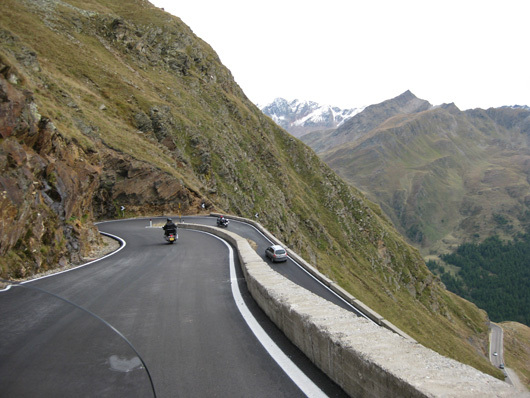 Oh - the delights of Continental touring on the best motorcycle in the world. As always back at home I think we all look forward to our next European adventure. 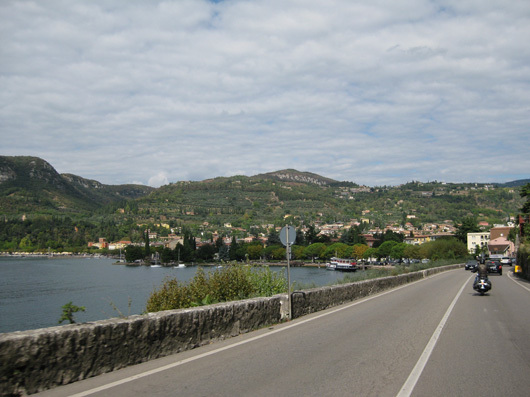 For a selection of photographs of Chelsea & Fulham’s journey to Lake Garda, Italy - European H.O.G. Rally visit the Gallery page and click on the Italy ’08 tab. Photographs kindly supplied by Linda Hlavacek.